Our online giving option makes it easy to make a one-time contribution or set up automatic recurring contributions. Simply click the Give Online button below to begin. 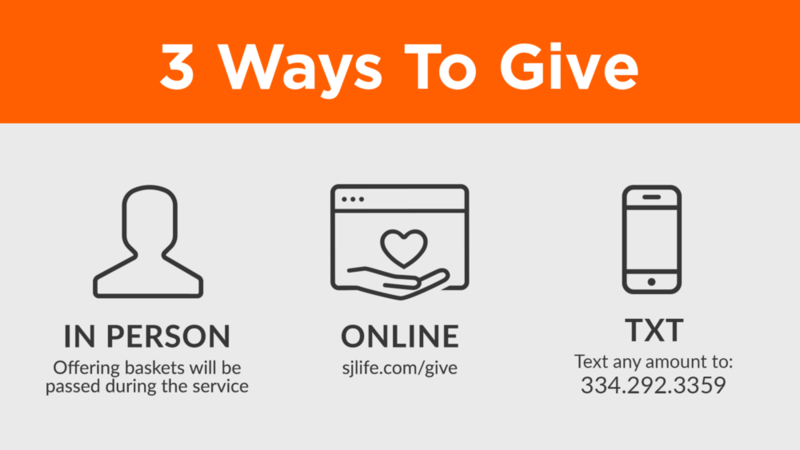 We now offer Text to Give as another way to give! To begin, text the amount you'd like to give ($dollar amount) along with a designated campaign hashtag (ie. #tithe for the General Budget) to 334-292-3359. You will then be sent a link and prompted to complete your secure online profile. Once this initial set up is done, you can Text to Give at any time and also set up recurring gifts. Remember, this is a secure, safe way to give! If you have any questions, email us at info@sjlife.com and we will be happy to help.